A series of 29 wildfires ignited across Southern California in December 2017. Six of the fires became significant wildfires, and led to widespread evacuations and property losses. The wildfires burned over 307,900 acres (1,246 km2), and caused traffic disruptions, school closures, hazardous air conditions, and power outages; over 230,000 people were forced to evacuate. The largest of the wildfires was the Thomas Fire, which grew to 281,893 acres (1,140.78 km2), and became the largest wildfire in modern California history, until it was surpassed by the Ranch Fire in the Mendocino Complex, in the following year. 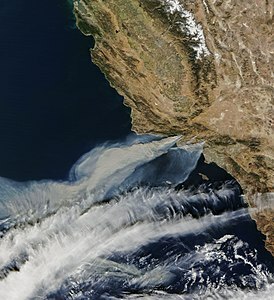 Satellite image of the smoke from the Thomas Fire and 2 smaller wildfires, on December 5, 2017. On December 5, Governor Jerry Brown declared a state of emergency for Ventura and Los Angeles Counties, followed by San Diego County on December 7; U.S. President Donald Trump subsequently declared a State of Emergency for California on December 8. This swarm of wildfires was exacerbated by unusually powerful and long-lasting Santa Ana winds, as well as large amounts of dry vegetation, due to a then-far unusually dry rainy season thus far. They also occurred at the end of an unusually active and destructive wildfire season; the fires cost at least $3.5 billion (2018 USD) in damages, including $2.2 billion in insured losses and $300 million in fire suppression costs. Map of the Thomas Fire and adjacent fires. These maps depict the location and burn areas of some of the major wildfires. Location of the California wildfires in December 2017. The first report of the fire was at 6:26 p.m. on December 4 just north of Santa Paula, near Steckel Park and Thomas Aquinas College. Fanned by Santa Ana winds, over the next few hours it rushed 12 miles (19 km) across rural backcountry into the city of Ventura, burning close to 500 homes and consuming 50,000 acres (200 km2). Over the next days, it advanced toward Ojai and had jumped Highway 33 and the Ventura River into the Rincon Oil Field area. By December 8, the Thomas Fire had grown to 143,000 acres (580 km2) with only 10% containment, and fire officials estimated that the fire had cost at least $17 million to fight. By the evening of December 10, the Thomas Fire had reached 230,000 acres (930 km2) in size, becoming the fifth largest wildfire in modern California history, and the largest wildfire recorded in California during the month of December. There were multiple periods of time when the fire was advancing at a rate of over an acre a second. The Thomas Fire had also destroyed at least 794 structures while damaging 187 others, and cost at least $38.4 million to fight, becoming at least the 10th most destructive wildfire in California history. Early on December 11, the Thomas Fire had grown to 230,500 acres (933 km2), while containment of the fire had increased to 15%. On December 13, the Thomas Fire's northwestern flank linked up with its southwestern flank, to the east of Carpinteria, enveloping an area containing Ojai and Lake Casitas. Early on December 16, the Thomas Fire reached a size of 259,000 acres (1,050 km2), with 40% containment, surpassing the Rim Fire as California's third-largest wildfire. On December 19, the Thomas Fire reached 272,000 acres (1,100 km2), with 55% containment, surpassing the burn area of the Rush Fire in California to become the second-largest wildfire in modern California history. During the evening of December 22, the Thomas Fire expanded further to 273,400 acres (1,106 km2), with containment at 65%, surpassing the Cedar Fire of 2003 to become California's largest wildfire in modern history. On December 24, the Thomas Fire grew to 281,620 acres (1,139.7 km2), after the fires from a back-burning operation completely merged into the Thomas Fire's northwestern flank, though containment of the wildfire also increased to 86%. On December 5, at 12:28 p.m. PST, a wildfire broke out near University Parkway and Varsity Avenue in San Bernardino city, just off Interstate 215. The wildfire quickly grew to 100 acres (40 ha), causing the closure of Interstate 215, and triggering evacuation orders for residents in the area. Students at Shandin Hills Middle School, on Little Mountain Drive, were also evacuated to Holcomb Elementary School. At 6:30 p.m. PST on the same day, the road closure and the evacuation orders had been lifted, though the Little Mountain area still remained closed off. On December 6, the Little Mountain Fire grew to 260 acres (110 ha), while firefighters worked to contain the flames. Firefighters made progress on the fire that day, due to the weakening of the Santa Ana winds in the area beginning on the evening of December 5. During the evening of December 7, firefighters managed to extinguish the Little Mountain Fire, with no increase in acreage. Three civilians were burned by the fire, and were sent to a hospital for treatment. Three garages suffered minor damage, but no other structures were damaged by the fire. An investigation revealed that the fire was caused by an illegal cooking fire at a homeless camp. The Liberty Fire was reported on December 7, at 1:14 p.m. PST, in Murrieta, in Riverside County. The Liberty Fire began as a vegetation fire. By the evening the Liberty Fire had grown to 300 acres (120 ha), with 10% containment. On the next day, with the improved weather conditions, firefighters made much more progress on the fire, bringing it to 90% containment. Late on December 9, the Liberty Fire was fully contained. Six structures and an outbuilding were destroyed by the fire. On December 7, a small brush fire broke out at Huntington Beach. The small brush fire burned 2 acres (0.81 ha) before it was fully contained on the same day, damaging a daycare center and a bank. On December 7, 2 small brush fires broke out north of Buellton, in Santa Barbara County. The brush fires were collectively dubbed as the "Woodchopper Incident", with the first fire burning 5 acres (2.0 ha) and the second fire burning 4 acres (1.6 ha), before they were both contained later on the same day. The brush fires briefly caused the closure of Highway 101. On December 8, at 9:30 a.m. PST, the Sweetwater Fire broke out in eastern San Diego County, south of Interstate 8 and just west of Japatul Valley Road, in Descanso. The wildfire burned about 8 acres (3.2 ha) of land, before it was fully brought under control about 4 hours later. On December 8, sometime before 12:56 p.m. PST, a small brush fire broke out in the El Sereno neighborhood of Los Angeles. Firefighters quickly extinguished the fire in a little over an hour, after the fire had burned 6 acres (2.4 ha). On December 8, around 2:15 p.m. PST, a small brush fire broke out in Otay Mesa Canyon, in southern San Diego County. Firefighters were able to quickly extinguish the flames. Early on December 11, firefighters quickly put out two small fires in Ocean Beach, San Diego. At around 2:15 a.m. PST, firefighters put out a burning fence in the 4,400 block of Santa Cruz Avenue, before responding to another shed fire less than a mile away, on Muir Avenue at 2:30 a.m., which damaged an RV. Arson investigators believe that the two fires are connected. On December 11, two wildfires ignited along Interstate 805 in southern San Diego. The first fire ignited near Route 54 and Interstate 805, which was quickly extinguished. The second fire ignited at 2:07 p.m. PST at Interstate 805, to the south of Mesa College. This fire triggered the closing of the right two northbound lanes of Interstate 805 (on the side of the fire), and the fire burned 0.5 acre (0.20 ha) before firefighters were able to stop its spread. On December 13, a small brush fire broke out in Oxnard, near Highway 101, just after 7:50 AM PST. The fire reached a quarter acre in size, before it was quickly contained within an hour. During the night of December 15, just before 10:10 p.m. PST, a small brush fire broke out near Otay Valley Road, near a trucking facility in Otay Mesa, in southern San Diego County. The fire burned about 20 vehicles, before it was brought under control. On December 19, at 8:20 a.m. PST, a small fire broke out at San Diego International Airport, near the 4000 block of Pacific Highway. The fire burned through a storage area and a couple of businesses, before firefighters were able to get the fire under control several hours later. The fire is estimated to have caused at least $1 million in damage. The December 2017 wildfires burned large areas of land and resulted in large property losses. In addition, the wildfires forced over 230,000 residents to evacuate their homes. California Governor Jerry Brown declared a state of emergency in Ventura and Los Angeles Counties on December 5, and San Diego County on December 7. Los Angeles mayor Eric Garcetti declared a state of emergency for the city on December 6. U.S. President Donald Trump declared a state of emergency for the state of California on December 8. One civilian death was recorded, a 70-year-old woman, Virginia Pesola, from Santa Paula. In addition, Cory Iverson, a firefighter, perished while fighting the Thomas Fire. "This is a tragic reminder of the dangerous work that our firefighters do every day," said Los Padres National Forest Supervisor Teresa Benson in a release. "The Thomas Fire has many unprecedented conditions and complexities that challenge the already demanding job of fire suppression." The wildfires destroyed many acres of forest. Due to the lack of trees' roots holding the soil together, the ground had reduced stability and was vulnerable to mud slides in heavy rain. In early January 2018, heavy rain was predicted for the American Southwest, causing flash flood watches and evacuations to be issued for portions of California affected by wildfires. ^ "Current Fire Information - 2017". January 12, 2018. Retrieved May 26, 2018. ^ a b "California wildfire industry losses put at $13.2bn by Aon Benfield". Artemis.bm. January 25, 2018. Retrieved August 30, 2018. ^ a b "California spent nearly $1.8 billion last year fighting major wildfires". Los Angeles Times. March 1, 2018. Retrieved August 30, 2018. ^ a b c Eliott C. McLaughlin; Nicole Chavez; Paul Vercammen; Steve Aimasy (December 8, 2017). "California fires: Two people burned in new blaze". CNN. Retrieved December 8, 2017. ^ a b "Southern California Fires Live Updates: More Areas Under Siege as Wind Gains Strength". The New York Times. December 7, 2017. Retrieved December 7, 2017. ^ Morgan Winsor; Mark Osborne (December 9, 2017). "Firefighters taming Southern California wildfires as Gov. Brown warns of state's 'new reality'". ABCNews. Retrieved December 10, 2017. ^ a b "Southern California wildfires still burning as Donald Trump issues federal emergency declaration". ABC News. December 9, 2017. Retrieved December 11, 2017. ^ "California Wildfires Upend Exams at Region's Colleges and Heighten Tensions at UCLA". The Chronicle of Higher Education. December 7, 2017. Retrieved December 8, 2017. ^ "Thomas Fire Smoke Besieges Two Counties". NBC Southern California. Retrieved December 14, 2017. ^ Smith, Sarah Parvini, Dakota. "Some fire hydrants didn't work because of power outages, firefighters say". latimes.com. Retrieved December 14, 2017. ^ a b Aaron Bandler (December 8, 2017). "Over 212,000 People Forced to Abandon Their Homes As Southern California Fires Rage On". jewishjournal.com. Retrieved December 9, 2017. ^ a b "Thomas Fire Quick Update: 12/19/2017, 6:00 PM" (PDF). CalFire. December 20, 2017. Retrieved December 20, 2017. ^ a b "Creek Fire near Sylmar now 11,000 acres; 30 structures burned". ABC7.com. December 5, 2017. Retrieved December 6, 2017. ^ Etehad, Melissa; Nelson, Laura J. (December 5, 2017). "Rye fire spreads to 5,000 acres, triggers evacuations and gridlock in Santa Clarita". Los Angeles Times. Retrieved December 8, 2017. ^ Repard, Pauline. "California fires: some San Diego County evacuation orders changed from mandatory to voluntary". San Diego Union Tribune. Retrieved December 10, 2017. ^ Berman, Mark; Rosenberg, Eli (December 6, 2017). "Ferocious wildfires rage across Southern California as new fire breaks out in Los Angeles". Washington Post. ISSN 0190-8286. Retrieved December 6, 2017. ^ Berke, Jeremy; Logan, Bryan (December 6, 2017). "Schools and freeways closed, thousands of people forced to flee as multiple wildfires tear through Southern California". Business Insider. Retrieved December 6, 2017. ^ Jones, Judson; Criss, Doug (December 6, 2017). "A look at the California wildfires' jaw-dropping numbers". CNN. Retrieved December 6, 2017. ^ Fuller, Thomas (December 6, 2017). "California Today: Outlier Fires Are Becoming the Norm". The New York Times. ISSN 0362-4331. Retrieved December 6, 2017. ^ Woodyard, Chris (December 6, 2017). "New brush fire sets homes ablaze in Los Angeles' toniest neighborhoods". USA Today. Retrieved December 6, 2017. ^ a b Yee, Christopher (December 6, 2017). "State of emergency declared for Los Angeles County as Creek, Rye fires continue to burn". The Mercury News. Retrieved December 6, 2017. ^ a b "Oceanside, Pendleton in Lilac Fire's Path: Cal Fire". NBC Bay Area. Retrieved December 8, 2017. ^ a b "Southern California Fires Live Updates: New Blaze Breaks Out in San Diego County". The New York Times. December 8, 2017. ISSN 0362-4331. Retrieved December 8, 2017. ^ Nelson, Laura J.; Hamilton, Matt; Tchekmedyian, Alene (December 6, 2017). "Santa Ana winds roar through Southern California, whipping fires on destructive path". Los Angeles Times. ISSN 0458-3035. Retrieved December 6, 2017. ^ "Riverdale Fire". CalFire. December 6, 2017. Retrieved May 26, 2018. ^ a b Madison Park and Cheri Mossberg (December 5, 2017). "'Fire is still out of control' as massive blaze forces thousands to evacuate". CNN. Retrieved December 5, 2017. ^ "Deadly Thomas Fire in Ventura County explodes to 31,000 acres overnight, 150 structures burned". Fox5News. December 5, 2017. Retrieved December 5, 2017. ^ a b "Thomas Fire". CalFire. March 28, 2018. Retrieved May 26, 2018. ^ "Incident Summary: Thomas Fire". Ready Ventura County. December 26, 2017. Retrieved December 26, 2017. ^ Shelby Grad (December 5, 2017). "Creek fire jumps 210 Freeway, spreads into Shadow Hills and Angeles National Forest". Retrieved December 6, 2017. ^ "Creek Fire". CalFire. December 21, 2017. Retrieved May 26, 2018. ^ "UPDATE: Rye Fire now at 1,000 acres and moving west #RyeFire". The Signal. December 5, 2017. ^ "Rye Fire". CalFire. December 12, 2017. Retrieved May 26, 2018. ^ "34-acre Meyers fire in Devore area is contained". San Bernardino Sun. December 6, 2017. Retrieved December 8, 2017. ^ "Meyers Fire". CalFire. December 6, 2017. Retrieved May 26, 2018. ^ a b c d Valenzuela, Beatriz E. (December 6, 2017). "Little Mountain fire in San Bernardino is 50 percent contained; firefighters fear tonight's winds". San Bernardino Sun. Retrieved December 6, 2017. ^ a b Serna, Joseph; Reyes-Velarde, Alejandra (December 5, 2017). "3 burned in wind-driven fire that's growing in San Bernardino County, officials say". Los Angeles Times. ISSN 0458-3035. Retrieved December 6, 2017. ^ a b c d Hagen, Ryan; Whitehead, Brian (December 5, 2017). "Little Mountain fire in San Bernardino forces evacuations, freeway closures". The Press-Enterprise. Retrieved December 6, 2017. ^ a b c "Little Mountain Fire". CalFire. December 7, 2017. Retrieved May 26, 2018. ^ "Truck fire sends 'flaming balls of paper' into vegetation off 15 Freeway in Devore". San Bernardino Sun. December 6, 2017. Retrieved December 8, 2017. ^ "Flaming Rolls Of Paper Spread Fire In Cajon Pass". Banning-Beaumont, CA Patch. December 5, 2017. Retrieved December 8, 2017. ^ Etehad, Melissa; Nelson, Laura J.; Kohli, Sonali (December 6, 2017). "Several homes burning in Bel-Air as fire closes the 405 Freeway and forces evacuations". Los Angeles Times. Retrieved December 6, 2017. ^ Margaret Stewart (December 15, 2017). "Skirball Fire Update". Los Angeles Fire Department. Retrieved December 16, 2017. ^ "Skirball fire in LA 100 percent contained". Los Angeles Daily News. December 15, 2017. Retrieved December 16, 2017. ^ Lyndsay Winkely (December 7, 2017). "Lilac fire off Interstate 15 chars at least 100 acres, destroys 2 structures". The San Diego Union-Tribune. Retrieved December 7, 2017. ^ "Lilac Fire". CalFire. December 16, 2017. Retrieved May 26, 2018. ^ a b April Newman (December 7, 2017). "Liberty Fire Incident Information Fact Sheet". Riverside County Fire Department. Retrieved December 7, 2017. ^ a b c "Liberty Fire Alert". Murrieta.gov. December 10, 2017. Retrieved December 10, 2017. ^ a b David Hernandez (December 8, 2017). "New brush fire ignites in east San Diego County". The San Diego Union-Tribune. Retrieved December 8, 2017. ^ a b "6-acre brush fire extinguished by LAFD in El Sereno". ABC7. December 8, 2017. Retrieved December 9, 2017. ^ April Newman (December 13, 2017). "Longhorn Fire Incident Information Fact Sheet". Riverside County Fire Department. Retrieved December 14, 2017. ^ "Coast Fire". CalFire. December 15, 2017. Retrieved May 26, 2018. ^ Kristina Houck (December 15, 2017). "Brush Fire Burns 100 Acres On Camp Pendleton". San Diego Patch. Retrieved December 15, 2017. ^ "Drum Fire". CalFire. December 17, 2017. Retrieved May 26, 2018. ^ "Riverbottom Fire". CalFire. December 24, 2017. Retrieved May 26, 2018. ^ Renee Schiavone (December 22, 2017). "Riverbottom Fire In Riverside Chars 50 Acres [UPDATED]". Banning Patch. Retrieved December 22, 2017. ^ Kristina Bravo; Chip Yost (December 22, 2017). "Brush Fire Near Downtown Riverside Burns 50 Acres; All Evacuations Lifted". KTLA 5 News. Retrieved December 22, 2017. ^ Reuben Vives (December 29, 2017). "Brush fire scorches 13 acres in Sunland-Tujunga area". Los Angeles Times. Retrieved December 31, 2017. ^ Tracy Bloom; Chris Wolfe (December 29, 2017). "Oro Vista Fire That Threatened Home in Sunland Area Knocked Down After Burning 13 Acres, LAFD Says". KTLA 5. Retrieved December 31, 2017. ^ Melissa Etehad (December 8, 2017). "Authorities report progress on Thomas fire; some evacuation orders lifted". Los Angeles Times. Retrieved December 9, 2017. ^ Melissa Etehad; Ruben Vives; Harriet Ryan; Alene Tchekmedyian (December 11, 2017). "At 230,000 acres, Thomas fire is now the fifth-largest wildfire in modern California history". Los Angeles Times. Retrieved December 11, 2017. ^ Lydia O'Connor (December 10, 2017). "California's Thomas Fire Now Ranks Among Largest In State History". HuffPost. Retrieved December 11, 2017. ^ a b "Thomas Fire Incident Update: 12/11/2017, 7:00 AM" (PDF). CalFire. December 11, 2017. Retrieved December 11, 2017. ^ Chelsea Edwards (December 11, 2017). "Thomas Fire grows to 230,000 acres as it continues destructive path into Santa Barbara County". ABC 7. Retrieved December 11, 2017. ^ Tom Bolton (December 11, 2017). "Thomas Fire explodes to 230,500 acres — now 5th largest in California history". The San Luis Opispo Tribune. Retrieved December 11, 2017. ^ "Thomas Incident Public Information Map: December 15th, 2017". California Interagency Incident Management. December 15, 2017. Retrieved December 16, 2017. ^ Joseph Serna; Brittny Mejia (December 16, 2017). "With winds picking up, Thomas Fire threatening hundreds of homes in Montecito". Los Angeles Times. Retrieved December 16, 2017. ^ Hailey Branson-Potts; Nicole Santa Cruz (December 19, 2017). "The Thomas fire is now the second largest in modern California history". Los Angeles Times. Retrieved December 19, 2017. ^ Michael Livingston; Javier Panzar (December 23, 2017). "Thomas fire becomes largest wildfire on record in California". Los Angeles Times. Retrieved December 23, 2017. ^ "12-25-2017 Daily Update Thomas Fire". InciWeb. December 25, 2017. Retrieved December 25, 2017. ^ "Thomas Fire Progression Map: December 25, 2017". InciWeb. December 25, 2017. Retrieved December 25, 2017. ^ Nick VaVerka (December 19, 2017). ""Little Mountain" fire in San Bernardino caused by homeless encampment". KFI AM640. Retrieved January 29, 2018. ^ "Liberty Fire". CalFire. December 10, 2017. Retrieved May 26, 2018. ^ "New brush fire erupts in Huntington Beach". ABC7 News. December 7, 2017. Retrieved December 7, 2017. ^ Daniel Langhorne (December 7, 2017). "Huntington Beach brush fire damages daycare center and bank". Los Angeles Times. Retrieved December 8, 2017. ^ Taylor Hayden (December 7, 2017). "Brush Fires Break Out North of Buellton". Retrieved December 7, 2017. ^ Kristina Houck (December 8, 2017). "New brush fire ignites in east San Diego County". San Diego Patch. Retrieved December 8, 2017. ^ "Firefighters Knock Down Grass Fire In El Sereno". CBS Los Angeles. December 8, 2017. Retrieved December 9, 2017. ^ Christina Bravo (December 9, 2017). "Small Brush Fire Sparks in Otay Mesa Canyon". NBC 7 San Diego. Retrieved December 10, 2017. ^ Audra Stafford (December 11, 2017). "2 Fires Deliberately Set in Ocean Beach". NBC San Diego. Retrieved December 11, 2017. ^ "Arson investigators looking into suspicious fires in Ocean Beach". Fox5 San Diego. December 11, 2017. Retrieved December 11, 2017. ^ Kristina Houck (December 11, 2017). "Small Brush Fire Sparks In Serra Mesa". San Diego Patch. Retrieved December 11, 2017. ^ "Brush Fire Slows Traffic on Interstate 805". NBC 7 San Diego. December 11, 2017. Retrieved December 11, 2017. ^ Zac Self (December 11, 2017). "Flames from brush fire seen near Mission Valley on north I-805". ABC 10News. Retrieved December 11, 2017. ^ Christian Martinez (December 13, 2017). "Small brush fire in Oxnard quickly put out". VC Star. Retrieved December 22, 2017. ^ Cristina Bravo (December 16, 2017). "Approx. 20 Vehicles Engulfed in Flames in Otay Mesa: SDFD". NBC 7 San Diego. Retrieved December 16, 2017. ^ Marie Estrada (December 16, 2017). "Junkyard fire sparks in Otay Mesa". ABC 10News. Retrieved December 16, 2017. ^ Brie Stimson; Cassia Pollock (December 19, 2017). "2-Alarm Fire Rips Through Businesses Near Airport: SDFD". NBC 7 San Diego. Retrieved December 19, 2017. ^ Karen Kucher (December 19, 2017). "Firefighters battle 2-alarm blaze off Pacific Highway". The San Diego Union-Tribune. Retrieved December 19, 2017. ^ "L.A. Declares Emergency as 200K Evacuate SoCal Wildfires". The Daily Beast. December 6, 2017. Retrieved December 6, 2017. ^ CNN, Nicole Chavez and Dakin Andone,. "California fires: Woman dies during evacuations". CNN. Retrieved December 14, 2017. ^ "Firefighter killed in the California Thomas Fire, the fourth-worst blaze in state history". Newsweek. December 15, 2017. Retrieved December 15, 2017. ^ Belles, Johnathan (January 5, 2017). "Evacuations Ordered for Southern California Burn Scar Areas Ahead of Expected Rainfall". weather.com. The Weather Channel. Archived from the original on January 8, 2017. Retrieved January 10, 2018.